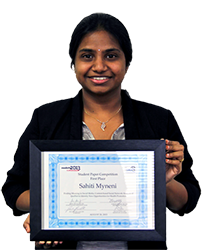 Sahiti Myneni, MSE, a student in the doctoral program at UTHealth School of Biomedical Informatics, placed first in the student paper competition at the International Medical Informatics Association’s 2013 World Congress on Medical and Health Informatics—commonly known as Medinfo. "The award is well deserved,” said Trevor Cohen, MBChB, PhD,an associate professor at SBMI who is a co-author of the paper and chair of Myneni’s doctoral advisory committee. “In this paper, Sahiti has applied her creativity, enthusiasm and constantly expanding methodological skillset to develop a novel approach to understanding human behavior change." A team of students from SBMI, including Jonathan Wolfarth, Anand Allam, Minal Desai and Adriana Stanley were selected as one of the eight finalists for the AMIA 2013 Student Design Competition, which focuses on reinventing clinical documentation. The SBMI team’s submission is titled, “Groupware to Facilitate Interdisciplinary Team Communications” and was guided by four SBMI faculty members—Amy Franklin, PhD; Dean Sittig, PhD; Peter Killoran, MD, MS; and Robert Vogler, MEd, DSN. Each paper was reviewed by at least three members of the student design competition committee on a variety of criteria, including understanding the clinical process, fit to the problem, innovation, transformative potential, completeness and clarity of the design process. The committee will be selecting four teams—out of the top eight submissions—to give oral presentations, which are planned for the morning of Tuesday, November 19. The winning team will be announced at AMIA's closing session. John Frenzel, MD, MS, is the chief medical information officer at The University of Texas MD Anderson Cancer Center, where he also serves as a professor in the Department of Anesthesiology and Perioperative Medicine. As CMIO, he has the responsibility to provide patients, providers and researchers access to information and tools to further their understanding of cancer and its treatment. He leads a team responsible for a comprehensive reporting environment that supports operational and research queries. 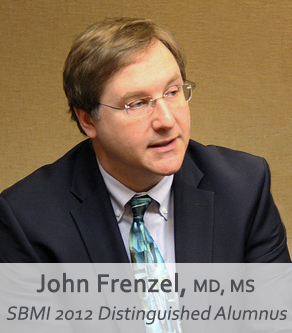 Frenzel moved up the ranks at MD Anderson from clinical assistant professor to full professor and CMIO. As such, Frenzel lends his expertise as part of the leadership team that will onboard MD Anderson’s newly announced off-the-shelf electronic health record system. Jiajie Zhang, PhD, Dr. Doris L. Ross Professor and School of Biomedical Informatics dean, will be speaking at The 2013 Texas Tribune Festival at 1:45 p.m. on Saturday, September 28 at The University of Texas at Austin's student activity center north ballroom. The session is called, “The Most Exciting Developments Coming out of Texas” and is part of the health care track at the festival. A video of the session will be available after the festival and will be sent to the SBMI and UTHealth communities. The 2013 Texas Tribune Festival is a three-day conference featuring exclusive walking tour, receptions, networking opportunities, special keynote conversations and issue-based sessions in the following areas: criminal justice, energy, environment, health care, higher education, immigration, public education and transportation. This year the festival has been enhanced to provide a unique student experience with exclusive events and a #StudentsAtTheFest lounge. Students can attend the festival for $50 or volunteer for a shift and attend for free. Interested students can email festival@texastribune.org from their school-affiliated email address to get started. Other individuals (non-students) who’d like to attend can register online. The Gulf Coast Consortia’s National Library of Medicine Training Program in Biomedical Informatics is seeking applications for the predoctoral and postdoctoral fellowships. The training program provides research training in health care informatics, translational bioinformatics, clinical research informatics and public health informatics to predoctoral and postdoctoral trainees across the GCC's six member institutions, which includes UTHealth. All application materials are due by 5 p.m. on Wednesday, November 6. Interviews for selected applicants will be held on Monday, November 25, and appointments will begin on January 1, 2014. A recently instituted bylaw amendment for the American Health Information Management Association has opened student membership to a wider audience. Membership is no longer limited exclusively to students enrolled in schools accredited by the Commission on Accreditation for Health Informatics and Information Management Education or AHIMA approved programs. Any student currently enrolled in any formal certificate or degree-granting program that is directly relevant to AHIMA's purpose is now eligible to apply for student membership. Students may retain their AHIMA student membership until graduation, for a maximum of four years, or until the student registers for an AHIMA certification examination. Questions can be emailed to jessica.heraty@ahima.org. UTHealth School of Biomedical Informatics’ Strategic Health IT Advanced Research Projects (SHARPC) program is pleased to announce the release of Turf version 2.0, a software tool designed to evaluate, document and improve electronic health record usability. Turf supports user testing and heuristic evaluation as an all-in-one integrated software system. Turf has been developed to assist in the assessment of EHR usability and will semi-automate the summative testing process that is used to meet the safety-enhanced design requirements of meaningful use for EHRs. The 2.0 version of Turf is the first non-beta version and is available free of charge for a three-month trial period under a license that allows academic, research, experimental purposes or to determine if a commercial license is desired. 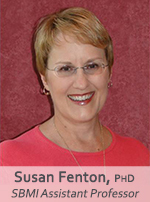 SBMI assistant professor Susan Fenton, PhD, was interviewed by Melissa Wilson on Wednesday, September 11 on Fox 26 morning news as part of the economy news segment. The interview covered an overview of health informatics, career opportunities in health information technology, and where to receive education and training. “There’s a huge need for health care to utilize everything that technology has to offer to both support patient care and to try to improve it,” said Fenton. Trevor Cohen, MBChB, PhD, SBMI associate professor, received a three-year grant, effective September 1, from the National Library of Medicine. In the proposed research, Cohen and his team will develop and evaluate models of biological plausibility based on knowledge extracted from biomedical literature and using methods of hyperdimensional computing for efficient search and inference across multiple concepts and relations. These methods will be used to selectively identify plausible drug-event pairs extracted from unstructured data—consisting of patient records in the UTHealth clinical data warehouse—using natural language processing. If successful, the proposed research will provide the means to identify automatically plausible drug-event pairs for regulatory purposes, limiting the consequences of previously undetected side effects. In addition, the methods will provide a generalizable approach that can be used to apply knowledge derived from the biomedical literature to interpret clinical data. A full news release will be distributed in the coming weeks. 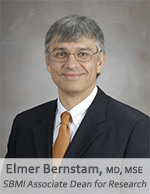 Elmer Bernstam, MD, MSE, SBMI professor and associate dean for research, received a three-year grant, effective September 1, from the National Cancer Institute. His wife, Funda Meric-Bernstam, MD, professor of surgical oncology at The University of Texas MD Anderson Cancer Center, is also a principal investigator, and SBMI faculty members Trevor Cohen, MBChB, PhD and Hua Xu, PhD are co-investigators on the grant. The central hypothesis of the study is that the researchers can develop informatics tools to support personalized cancer treatment as 'standard of care' rather than 'one off' exceptions. The researchers will: 1) implement a bioinformatics pipeline for processing molecular data into actionable profiles, 2) create and maintain a database of therapeutic implications of common genomic aberrations using automated processing of publicly available sources, and 3) develop tools to summarize and present patient-specific advice to clinicians. These tools will be based on existing technologies and publicly available data sources. Once tested, randomized clinical trials will be conducted to determine the effect of the tools on clinical trial recruitment; subsequently, the tools will be made available via appropriate open source license. A full news release will be distributed in the coming weeks. Speaker: Asher Kramer Friday, September 27, 11 a.m. - 12:30 p.m.
Keck Seminar Friday, October 11, 4 to 5 p.m.
UTHealth Fun (Renaissance) Fest Friday, October 18, 2 to 5 p.m.
Don’t forget to bring your UTHealth ID badge to gain access to the good cheer and bountiful food! Health 2.0 Houston will host the first hackathon with the aim of creating innovations that keep astronauts healthy in space. All seminars are held from noon to 1 p.m. at the University Center Tower 7000 Fannin Street, room 1414, Houston, TX 77030. Individuals who are unable to attend the seminars in person can watch the seminar live or after the presentation on the school’s webcast. Seminar viewers and attendees are encouraged to fill out the seminar survey. Join the conversation! Follow the key points if you can't attend or tweet your feedback of the SBMI seminars: #SBMIseminar.